in everything they do. . ."
"The workmanship was the best." perfect "10" in all categories." We suspect that you agree. The painting industry is full of "painters." take our work very seriously. 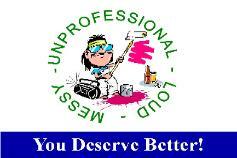 We would consider it a privilege to "Take the PAIN out of PAINting" for YOU!